We all know that bananas are great smoothie thickeners, but mangos are as well. So when you combine the two into a mango banana green smoothie you just know it's going to be thick and creamy. Add in some greens and you have a green thickie. These smoothies deliver on all levels: taste, texture and nutrition. We’ve already covered texture so let’s talk about taste. Mangoes have a naturally sweet taste, as do bananas provided they aren’t green. So you can simply stick with these two fruits or you can add other fruits as well. To keep it strictly tropical go with coconut or pineapple. Nutrition-wise these smoothies really deliver. Bananas are one of our best sources of potassium, as well as containing vitamins A, K C and E. Mangos contain phenols, chemical compounds with powerful antioxidant properties. They are also rich in iron and vitamins C and A. Spinach is also extremely rich in antioxidants as well as vitamins A, C and E.
Combine all these benefits and what you have is a green vitamin drink. Chop the medjool dates in half and remove the pits. Take a cup of greens (I used baby spinach leaves) and place in the bottom of a blender. Add a chopped banana, chopped mango and almond milk and blend until smooth. Add the medjool dates and continue blending until your smoothie is nice and creamy. This smoothie will have you dreaming of tropical beaches and palm trees. 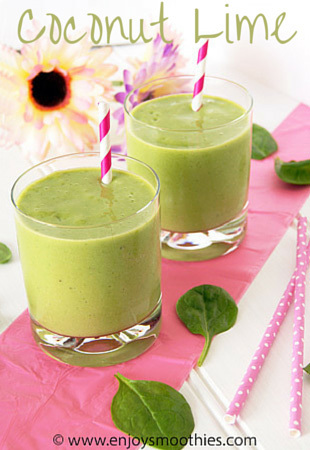 Place the banana, mango, spinach leaves, coconut milk, lime juice and cardamom into your blender. Process until you have the desired consistency. Pour into 2 glasses and enjoy. If you are not using all frozen fruit, then you may need less coconut milk. 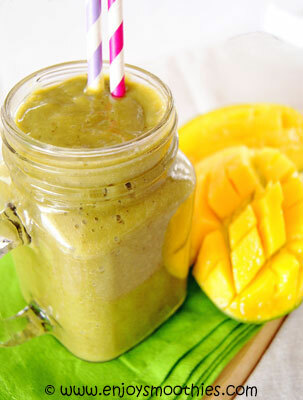 Place the frozen mango, spinach leaves and pineapple juice into the jug of a blender and blend first to break down the greens. Add the remaining ingredients and continue blending until your smoothie is thick and creamy.